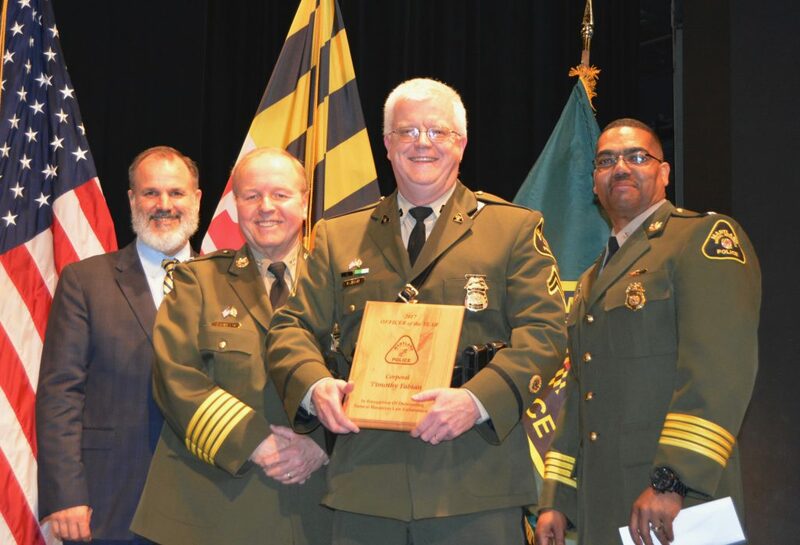 Maryland Natural Resources Police honored dozens of officers, civilian staff, first responders from other agencies and members of the public Saturday at its annual awards ceremony. 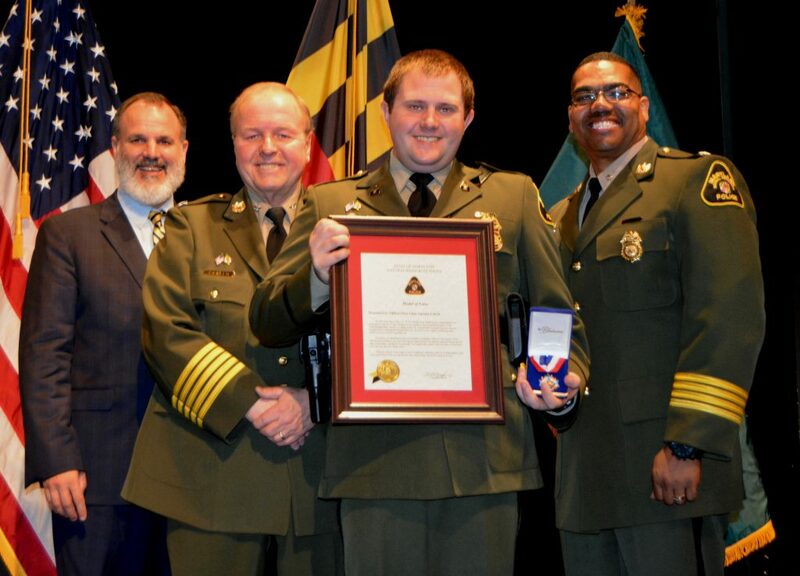 Officer First Class Antonio Colvin received the Medal of Valor, the agency’s highest award, for rescuing an injured duck hunter whose kayak capsized in the ice-choked water of the Chesapeake Bay off Anne Arundel County last January. He single-handedly maneuvered alongside the barely conscious victim and hauled him aboard his patrol boat, saving his life. Cpl. Timothy Fabian, who is assigned to the Central Region, was selected the 2017 Officer of the Year. Officer First Class Matthew Groleau, who patrols the Upper Eastern Shore, was selected Conservation Officer of the Year. Officer First Class Bryce Parrish, from the Eastern Shore, was honored as Boating Officer of the Year. Cpl. William McKinney, based in Cecil County, was chosen Support Services/Special Services Officer of the Year. Walter “Pete” Landon, the state director of homeland security and Gov. Larry Hogan’s deputy chief of staff, delivered the keynote address. He praised the officers for not only upholding conservation and criminal laws but also for being on the front line of Maryland’s maritime homeland security efforts. Landon congratulated Natural Resources Police on its 150th anniversary, making it Maryland’s oldest state police department. “The officers of Maryland’s Oyster Police Force who patrolled the Chesapeake back in 1868 would be very proud of you, the officers of the modern-day Natural Resources Police,” he concluded. Ten officers received the Award of Merit, the second-highest honor, for actions that saved lives on the water and land: Cpl. Vincent Artrip, Officer First Class Andrew Brayman, Cpl. John Bunting, Officer First Class Ryan Colon, Cpl. Jake Coxon, Officer First Class Matthew Groleau, Officer First Class Bryce Parrish, Officer First Class Christopher Severa and Cadet Kerri Weale. Other officers received Superintendent’s Commendations or Letters of Appreciation. Two police communications operators, John Anderson and Leonard Mathesius, received the Superintendent’s Special Achievement Commendation—the highest civilian award. Anderson helped officers rescue three fishermen whose boat capsized during a violent storm on the Chesapeake Bay. Mathesius was instrumental in coordinating a massive police manhunt after two Ocean City officers were stuck by a vehicle and the suspect attempted to swim away. The ceremony also honored six officers who were promoted during the last year. The ceremony, attended by Maryland Department of Natural Resources Secretary Mark Belton, Col. Robert K. “Ken” Ziegler Jr., the agency superintendent and Lt. Col. Ernest J. Leatherbury Jr., deputy superintendent, was held at Anne Arundel Community College.